Ladies were becoming more and more active in sports during the 1890's. Riding the wheel was a popular sport that everyone enjoyed. 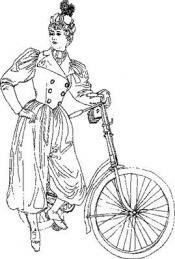 Conventional dresses would have been inappropriate for ladies on bicycles. New articles of clothing had to be designed, and so the Bicycle Dress appeared on the scene.��The outfit had Turkish trowsers made with such fullness that one would think it to be a skirt. They were wide at the bottom and drawn up to fit around the leg below the knee. The lower edge draped over gaiters. A short double-brested jacket is buttoned over a vest. Our 1894 Bicycle Dress fits Lady Marion, Lady Kathryn, and Fashion Plate Doll, and other 24 inch Lady Dolls with slender waist.